Does anybody else feel like summer is ending really quickly or is it just me? 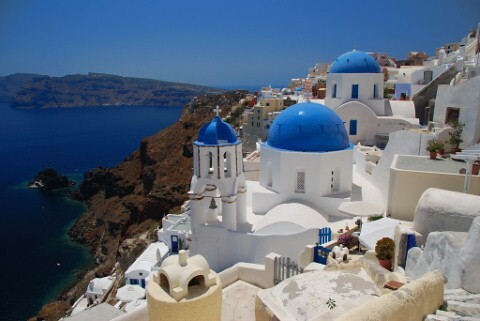 While we are driving back home we are stopping at two very amazing colleges that I would LOVE to attend because of their great medical programs, 1 being Duke University which I’m seriously in love with; and 2 being Georgetown University which I really like because a fellow blogger whom I love went their and shared her experience talks very highly of Georgetown. 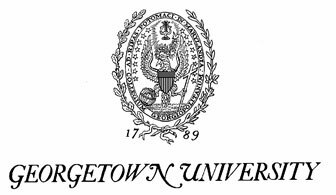 I’ll be on the road for the next couple of days and I’ll be sure to take a ton of pictures of Duke and Georgetown! If I had a ton of money I would buy seriously everything from Kate Spade, J.Crew, Lilly Pulitzer. 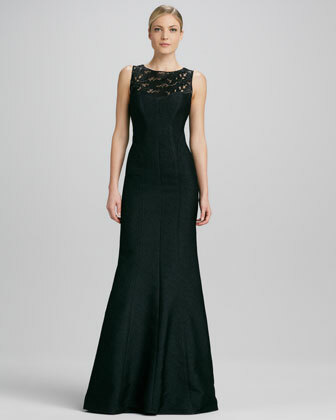 Anyway, I was looking on Bergdorf Goodman’s and I really love to look at the evening dresses, of course I’m dreaming of them but here are some of my picks that I seriously LOVE! I love the black and the sequins! 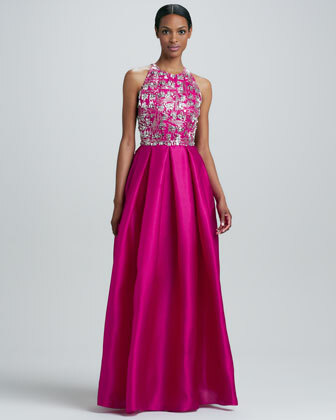 This dress’s color is amazing and the beaded bodice is drop dead gorgeous! 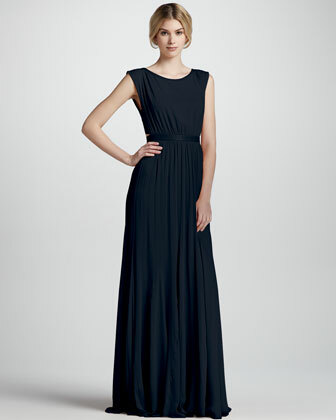 The dress is navy and I love the classic look and the neckline. 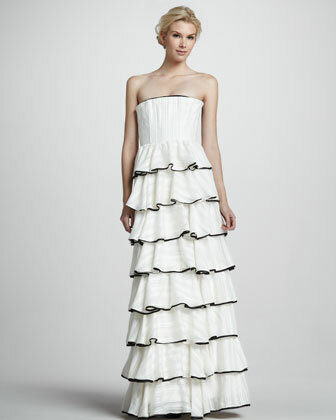 I love the frills and the white with the black outline. Does anybody else search online for their dream dresses? 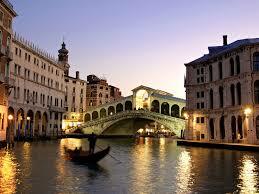 I want to visit these places someday but hopefully right after college. First off Happy Fourth of July Everybody! 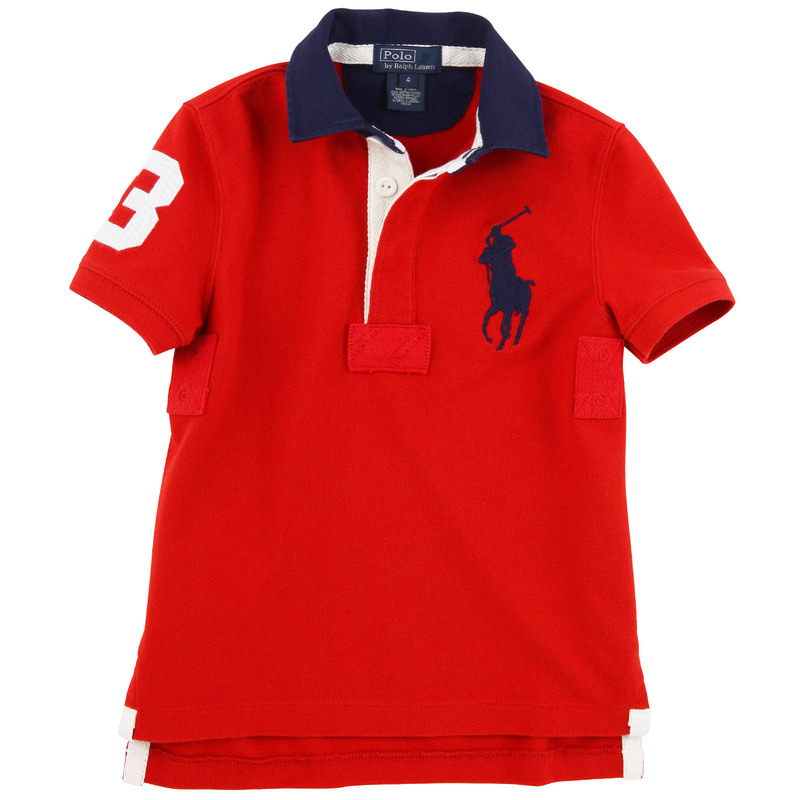 So I’m in Florida and as usual my something red that I will be wearing for 4 of July is of course a sunburn on my face:( I love wearing red white and blue so I’m going with my Ralph Lauren Navy Shorts and a Red Polo. Happy Fourth of July everyone hope everybody gets to see Fireworks! This afternoon I tried on a million shorts, dresses, and bathing suits and I absolutely can’t stand trying anything on! I got a couple really cute things from Macy’s. I got a Maxi Dress, 2 Bathing Suit Tops, and a Pair of Shorts. The shorts are white jean shorts by Tommy Hilfiger. 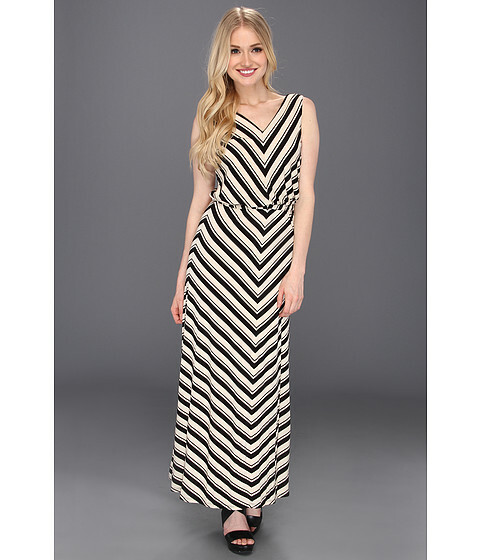 Maxi Dress I got, I’m thinking I’ll put a red or orange belt on it but I love the V-Neck! I got this top it’s by Coco Rave, I love the simple black and white which I’ll be pairing with my black bottoms I had. I love the colors of this suit I got the bottoms but the top I got is in a bandeau with orange on one side and pink on the other! I’m now officially ready to go to Florida on Tuesday! 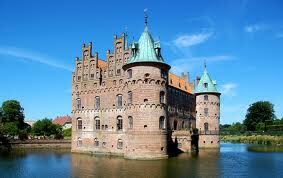 Anybody doing anything over the summer? I have a ton of sweatshirts and I really am not a sweatshirt fan so I want to sell them. All sweatshirts will be $5 and shipping will not be included so therefor you must pay for it. All of them are in great shape. Just email me at siciarciello@verizon.net if you would like them. 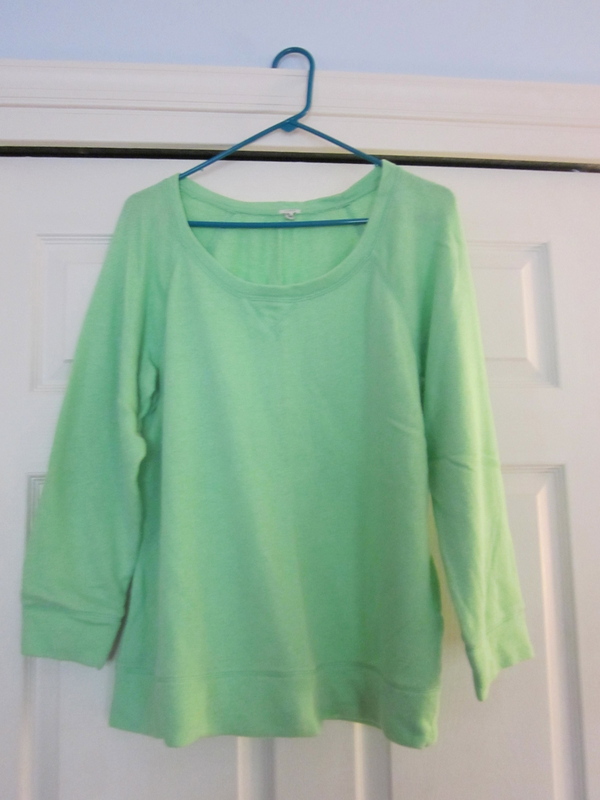 The first is a black hooded sweatshirt from Aerie it is a size Medium. It is very warm and comfy and kind of looks like a North Face Jacket. I love this sweater because you can easily pull it over anything! 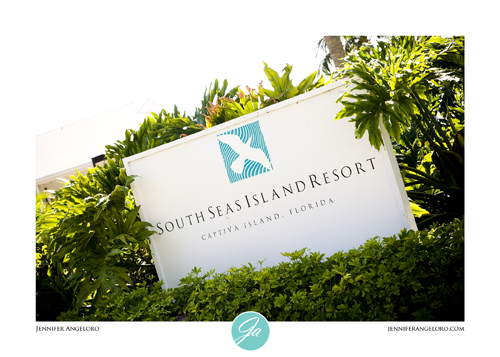 It is light weight, lime green, and is an Extra Large from J. Crew. This sweatshirt served it’s purpose when it was freezing in New York and I didn’t dress accordingly to the weather. 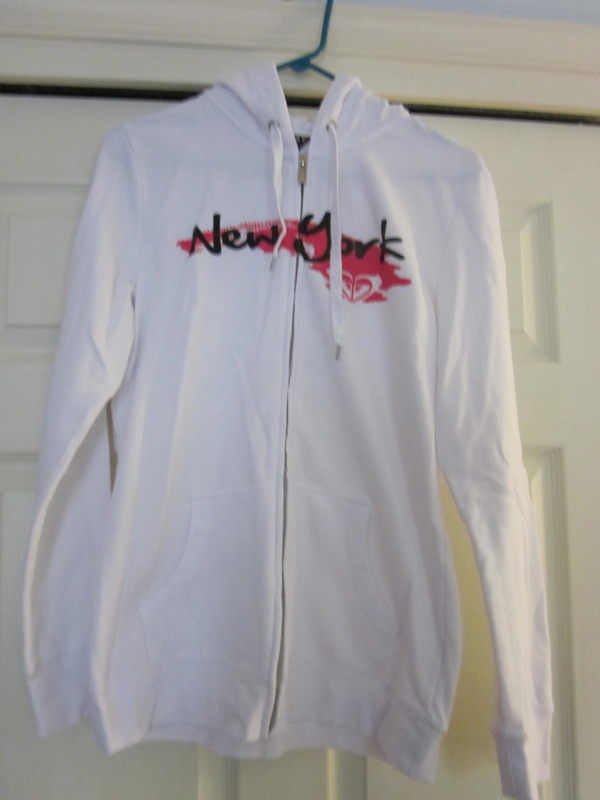 The sweatshirt says New York it is from the Roxy store and it a size Large. It is very comfy and warm and has a hood! I got this when I obviously went to the Great Wolf Lodge. 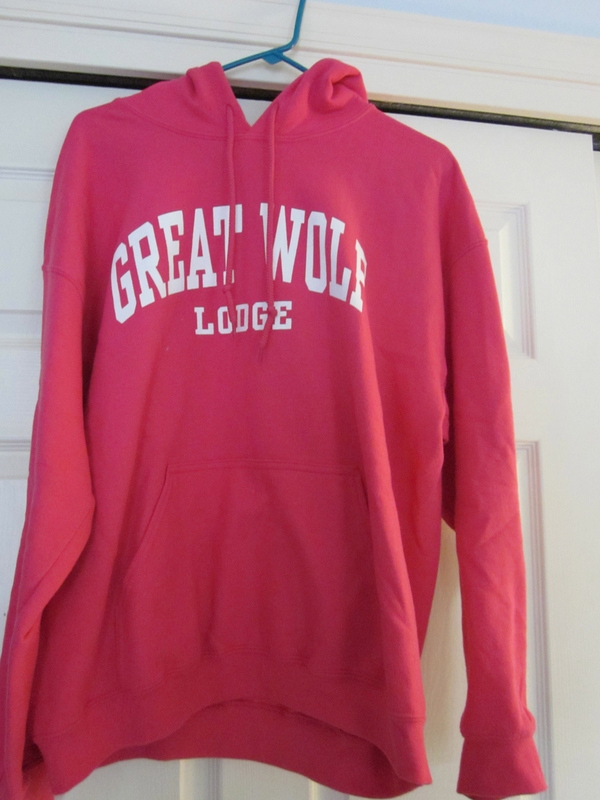 I love the raspberry color it has a hood and pocket and it is a size Large. 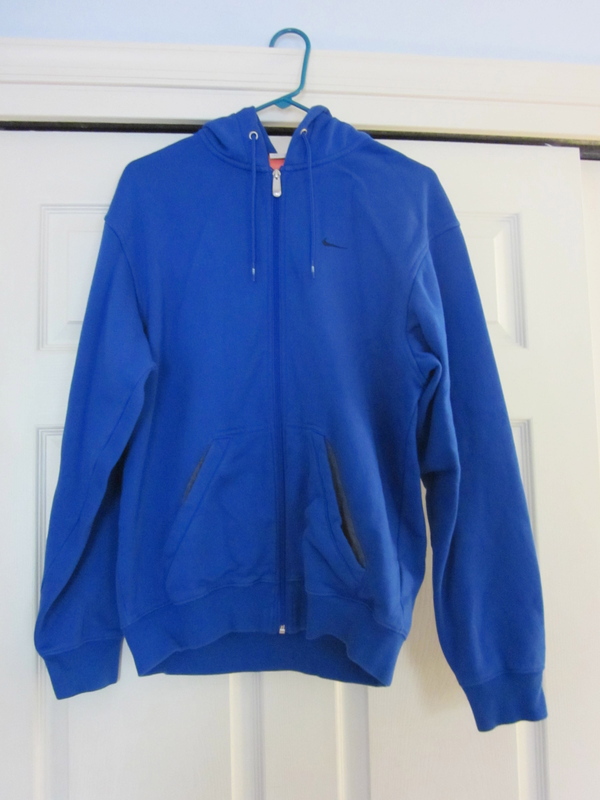 This is a Nike Men’s sweatshirt. 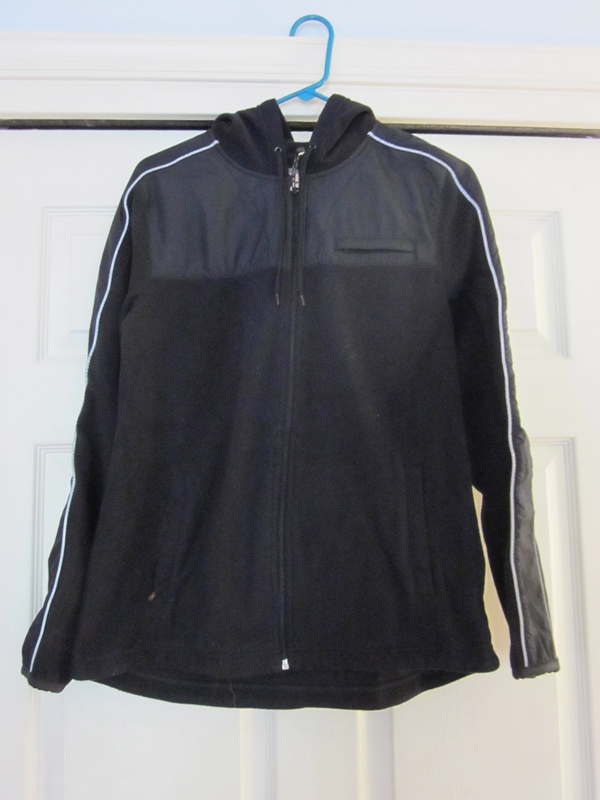 I love the zip-up with the hood so I got the men’s one instead of the plain white one that they had in women’s. I love the Philadelphia Phillies! 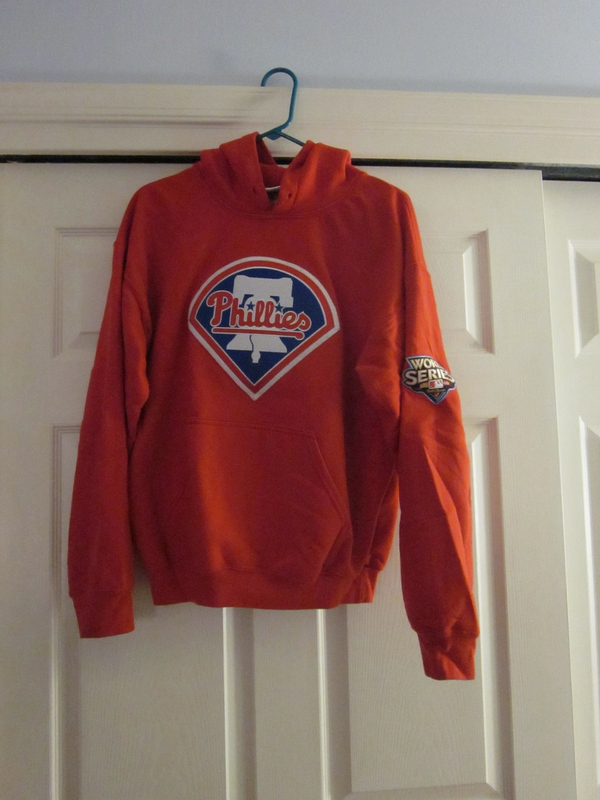 This sweatshirt is hooded and is a size Medium. 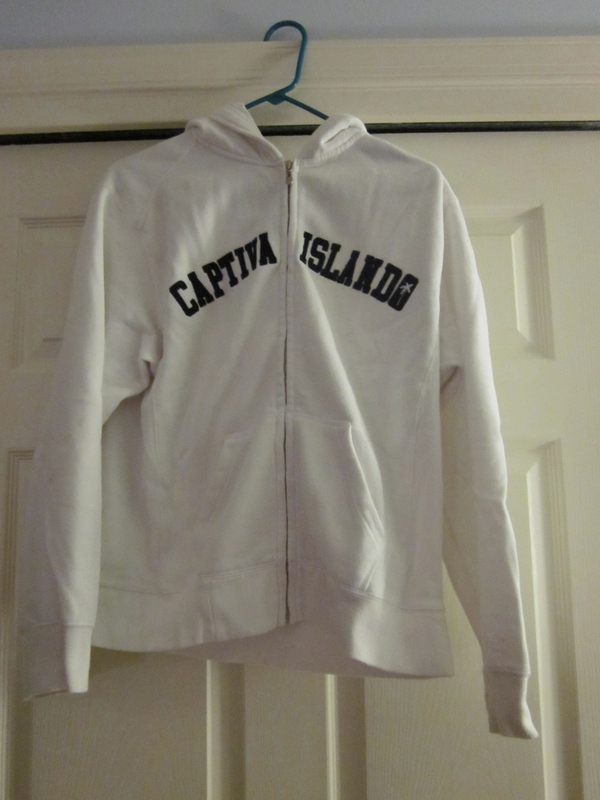 This is a hooded sweatshirt size Medium and says CAPTIVA ISLAND. It is zip-up and the writing is in navy blue! I hope people buy these sweatshirts!